When apocalyptic action film Edge of Tomorrow came out earlier this year, it bombed at the box office. Despite this, a few loud voices said the film was badly underrated and deserved to be given a chance (eg. Roger Ebert, The Atlantic, Mashable). Having missed it in the cinema, I optimistically decided to give it a shot at rental. Unfortunately, the early reviews were right: Edge of Tomorrow’s manages to make time-loops and the end of the world seem dull. 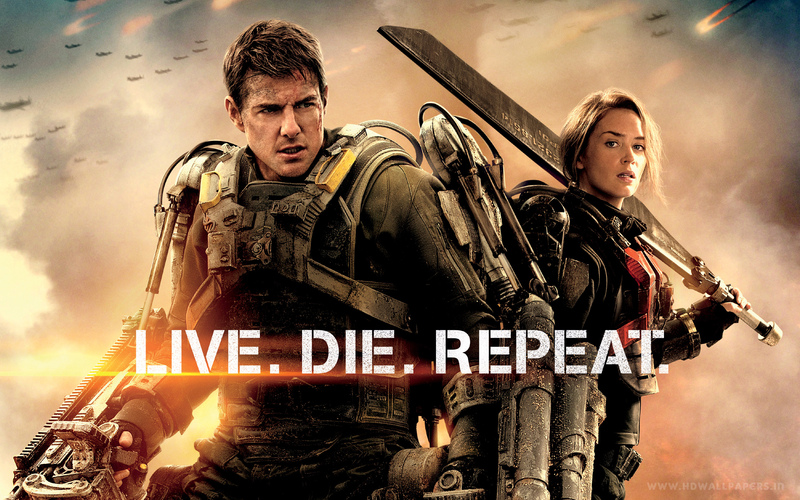 Edge of Tomorrow sees planet Earth on the brink of defeat in a war with aliens able to manipulate time. Tom Cruise (who plays Tom Cruise Acting In An Action Film) is a military PR man who gets sent to the front and snatches the aliens’ time powers moments before he dies. He wakes to live his last day over again, and again, and again, until he wins or the aliens regain control of the timeline. For a sci-fi action film, Edge of Tomorrow has a lot of good ingredients to work with: an apocalyptic scenario, high-tech weapons, time-loops, and a charismatic leading man. There was an opportunity here to do something special, like a cross between Groundhog Day and Independence Day. We could have had epic action, wry humour, the chance to see things from multiple angles; but Edge of Tomorrow squanders its material on…I’m not quite sure what. is released from the cycle. Like most comedies, Groundhog Day is not a long film. But in its short running time, it fully explores what a man could do with a time-loop and how the phenomenon would affect that man; it even touches on the metaphysical by questioning the meaning of life when one’s days seem never to change. In doing so, it wrote the book on how to make films based on the premise of Man Gets Caught In Unexplained Phenomenon, copied by half-hearted imitators like What Women Want. By contrast, Edge of Tomorrow manages less variety and completeness despite a longer 113-minute runtime. Instead of spending much time watching our hero try to do things differently in his looping day, we are forced to watch him try the same things over and over, and get a little bit closer to his one goal each time. He deviates only a couple of times, and it isn’t enough to preserve the notion that the film knows what to do with the endless opportunities of a time-loop mechanic. Without variety, a time-loop just isn’t fun to watch. It’s repetitive and boring. Edge of Tomorrow displays stunning lack of imagination, and fully deserved its box-office neglect.